This Kawasaki KZ200 is belong to Charles Iwan Tanaka. Builded by Mohammad Rifai also called Pei from 52 Custom at Kunciran, Pinang, Tangerang, Indonesia. They met when Charles looking for a chopper builder to modify his old Merzy motorcycle. They both know if KZ200 chassis was comfort on it's standard form. So they don't do much renovation on the backbone and downtube. It is precisely from the center to the back bone changes quite a lot. Most prominent in the swinging arm. Unusual construction, plus the outermost position is made longer than usual. To achieve a comfortable riding position. Moreover, this bike is targeted comfortable, completely avoid the construction of hardtail. Double conventional rear shock uses Harley Davidson stock, while the front shock KZ200 standard. Major appliances handmade, from tank to fender. For wheels they choose in accordance with the dimensions KZ200, as a medium-capacity motors, simply mix 110/80-18 front and 190/50-17 for the rear. Both use the same brand of tires, Dunlop. 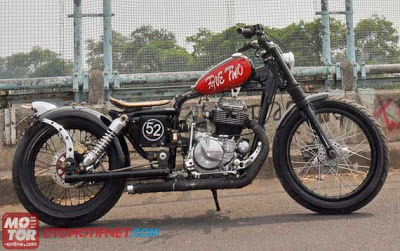 1 Tanggapan untuk "Soft Tail Chopper KZ200 1984"